about the same time as Scooby Doo. 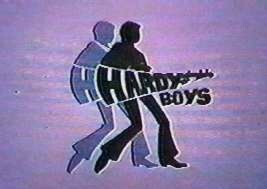 In this incarnation, The Hardy Boys were a traveling rock band that traveled the country and solved mysteries. Sound familiar? One of the cast was Pete Jones. He played the drums and sometimes a guitar in the band and assisted the boys on their detective adventures. 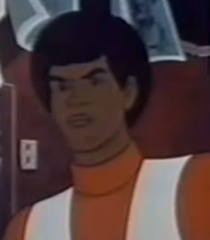 He has the distinction of being one of the first Black characters to appear on Saturday morning television. This was one year before Valerie Smith from Josie and the Pussycats debuted. He was smart, talented, and a positive role model overall. The cartoon ran on ABC opposite Scooby Doo on CBS. The series ran from 1969 to 1971, for 34 episodes. Despite never achieving the success of the Scooby gang, the show spawned an actual live-action Hardy Boys band which released two full length albums, both of which flopped. Included in the merchandise were action figures, more like statues actually, and Pete Jones was one of them. Nice post. I remember all sorts of Saturday morning flotsam and jetsam, but I never knew about this show. "The characters began in story books which have since been revised to, among other things, remove racist stereotypes." What do you think of this kind of editing? Is it self-conscious liberal whitewashing, or well-intentioned efforts at removing hurtful stereotypes? Should such books be edited this way, or removed from the shelves altogether, or left as-is for the sake of a "teaching moment"? As long as the original work and the reinterpretation both exist, I don't see anything wrong. A reinterpretation is just like an opinion. Whether you agree with it or not, don't people have the right to make them? "Whether you agree with it or not, don't people have the right to make them?" I'm not sure. That's why I asked; I can't decide. When it's a piece of pulp fiction like this, I suppose it's okay, but they also performed a similar edit on Mark Twain's books, and that strikes me as short-sighted and reckless.